MR. G. C. LEWIS was proposed and seconded by The REV. ARCHER CLIVE, and SIR VELTERS CORNEWALL, Bart. Mr. KING by the REV. JOHN HOPTON, and Mr. T. S. BRADSTOCK. FINAL STATE OF THE POLL AS DECLARED BY THE SHERIFF. Notes: On the voters register numbers 3086 to 3168 appear to have been assigned to Bosbury Parish. Of these 83 voters, 60 have registered their vote - a very respectable turnout. In the two neighbouring parishes of Castle Frome and Coddington a total of 16 people are registered but only half voted. 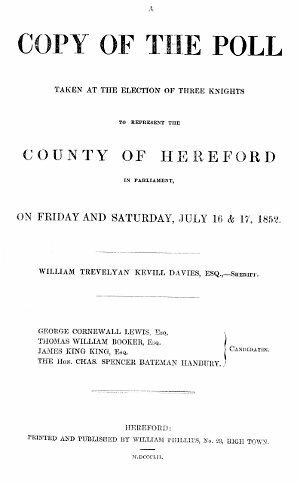 The bound volume for Herefordshire is available at Hereford Library.